Limo Theme is quite universal and covers a lot of use cases for either big e-commerce website or smaller ones. Due to 5 different landing pages you can easily guide a client whether directly to a specific product or to a category page. The Product Showcase Home page is a full featured landing page for effective product or service promotion. 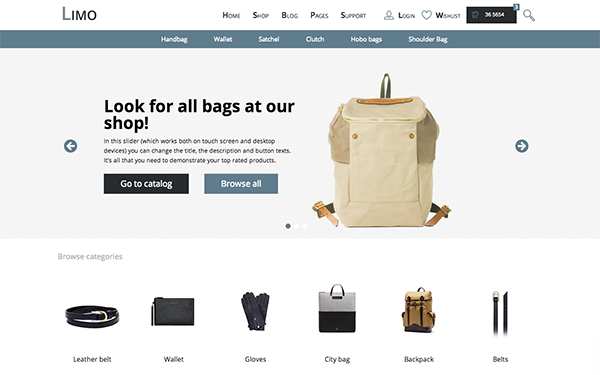 How do you think what online-store design would bring more benefits: the one created by a designer or by a team of a designer and e-commerce professional? The answer is obvious. We didn’t have long thought and started to develop the universal Limo theme - a well thought-out template of a fully-functional online-store. Open the preview if you are already curious. In case you would like to get more info about key features of the Limo theme and development approach below you will find a short description. 5 types of Home Pages. Home Product Showcase. Do you sell a lot of premium-products or a new arrival is on its way? This page (which is a fully-functional Landing Page) will help you to introduce your product. Thanks to masterly put “eye catchers” the interested user will be able to easily purchase it. Home Categories Slider. In case you know that your users don’t search for a specific product but start from a specific category we have created a separate Home page with a slider which greatly helps to introduce some of your categories. Believe us, that increases conversion rate! Home Special Offers. Are you going to target a narrow product segment and to quickly attract potential customer’s attention? Our module can help you with that and your customer will be able to checkout conveniently and intuitively. Besides the universality our theme has usability advantages which are known for those who have experience in e-commerce domain. Compact Menu. A fixed menu which is always visible when a page is scrolled makes more users to click deeper into the web site than a traditional menu which is either positioned at the top or at the bottom of the page. It’s obvious that an user feels much better when he doesn’t need to scroll every time to find a menu. Functional Tracking Page with a clear display of order status and order information. Innovative History Page with a detailed order info, including product image. Separate Coming Soon Page is included into the template. Among technical features we can notice a clean code and usage of LESS preprocessor.